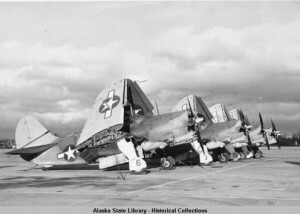 Military airplanes on runway with wings folded up, Dutch Harbor, Alaska, circa 1944. ASL-P338-0420, H. Marion Thornton Photograph Collection, Alaska State Library-Historical Collections. Short accounts written by Alaskan historians about a few topics that reflect Alaska’s varied history. Go to the Alaska Historical Society’s 49 History blog to see more recent and varied essays about Alaskan historical topics. Select a link from below to read stories.